A wee bit sad to leave Portland, OR on November 1st. We'd had a really great time there this summer with lots of friends, played a lot of happy gigs... and it was over for the year. Happy to be on the road again and heading for our new house in Florida. The road trip was great - this is an amazing country and the weather was kind to us on the way down. Cold by night and nice by day. We took 15 days in total including a days stop for my birthday in New Mexico and an extra day in Memphis... because is was Memphis. Hey - I'm skipping ahead - let's go back to the end of October the Celtic festival in Ocean Shores. It was amazing again- so many people. It was sold out. Around 30 bands/ acts, great atmosphere and it all runs like clockwork over the six days. 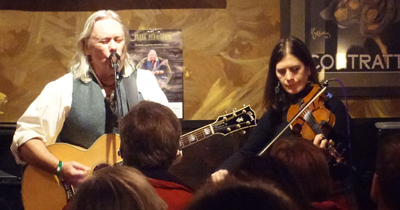 I played 11 shows from Tuesday to Friday, each one well attended with people openly enjoying themselves. Just looking out at a sea of happy faces makes you do your best every time. 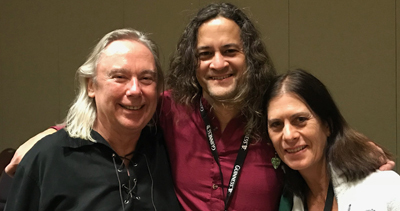 Lisa Gomes - is a great fiddle player from Hawaii and she played with me during the festival. We devised our "cunning plan" where Lisa would join on some songs and not on others. The result was pretty good and balanced. She is a joy to play with. After the last show on Saturday, we said farewell to Lisa and drove the 3.5 hours back to Portland - when I say we - it was the sober one who drove... not me. T C O'Learys, a lovely wee Irish pub on Alberta street. That was my last farewell to Portland for the season. There was a full house, plenty of my support / friends / lost souls showed up for one more blast and there was a nice local crowd there too. It's a great pub - you should go and check it out of you're in Portland.! 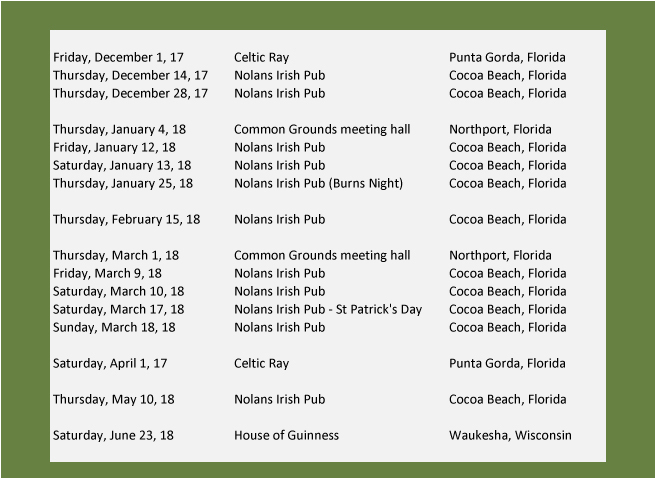 After a couple of weeks sorting out the house in Florida (6 miles from Dundee) we headed off to the Celtic Ray in Punta Gorda. It is a gem of a pub - a real Irish pub. Not one television in the place, a sign above the stage for the musicians "no Buffet, no Wagonwheel, no Eagles, no Lynard Skynard etc"... hahaha - it was clear - you know what your job is when you read that. The night went well, the crowd were good, the owner is a great character - good jokes and flowing delicious pints of Guinness. The food was great and they re-booked me - I'd say that's a successful 1st appearance. 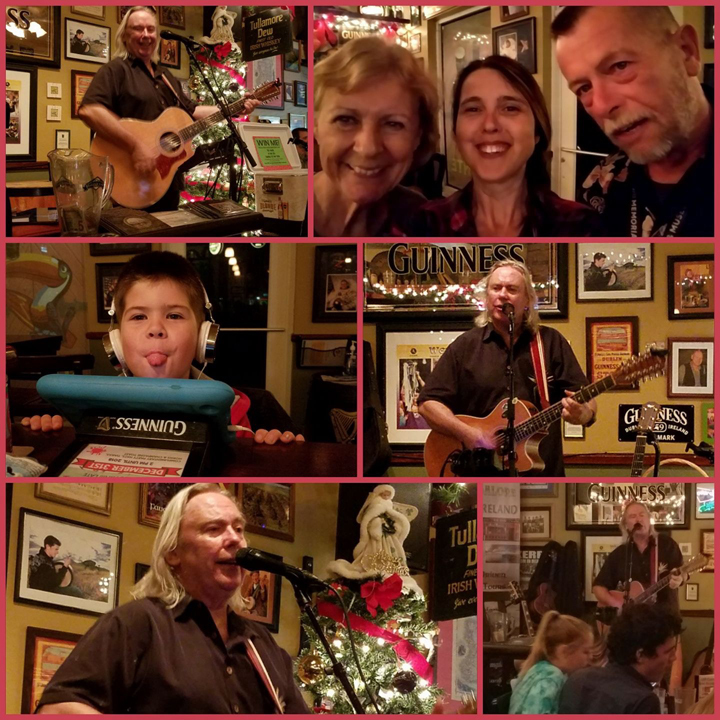 Thursday this week I played in Nolan's in Cocoa Beach - it was lovely to be back, walking into a pub on the opposite diagonal of the USA to be greeted with "Hello Bill, great to see you again, welcome back" and immediately I felt at home. The memories of past shows, people and events came flooding back again. It's a nice feeling. I enjoyed playing and settled in fine, a nice crowd. someone requested an old Val Doonican song "Paddy McGinty's goat" which I haven't sung for around 40 years. For obvious reasons (if you know the song). It was from a woman in a crowd of folks celebrating her fathers 82nd Birthday. Well, her father's 82 year old face lit up when I said I'd give it a go. No-one was more amazed than me when I sang every verse and never missed a word... there are just some songs that stick with you... unfortunately. Looking forward to being a Grandad - so now we know SHE is due on April 24th in Wisconsin. The current plan is that we'll be in Wisconsin 1st 3 weeks in June, Portland, OR until July 22 then back to Wisconsin... for a bit. The rest depends on gigs, family events and will develop in due course. Watch this space!! My 1st show in Wisconsin is confirmed. 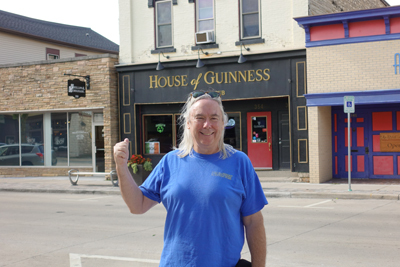 It will be Saturday June 23rd in the House of Guinness in Waukesha. We dropped by when we were there in September to check it out and talk to the folks there - and they came through - nice. I'll be adding more WI dates in June and August. The tickets for the two live radio shows at the Common Grounds Meeting Hall in North Port, FL with KDW Radio are all done and ready. We've put the two shows into a wee duo called "Coming and Going." The first one on January 4th, 2018 will be a celebration of the coming of the New Year and the going of the old one, themed around my experience of New Year parties as a boy in Dundee (enjoying myself (and sneaking some beer) at the Gibsons). The second one will be March 1st as the lead-up to St Patrick's day / week.. I will theme that around St Patrick's day including the differences in the way it was celebrated, in my experience, in Scotland, Ireland and the USA. This along with our frequent "comings and goings" inspired the title of the tour.